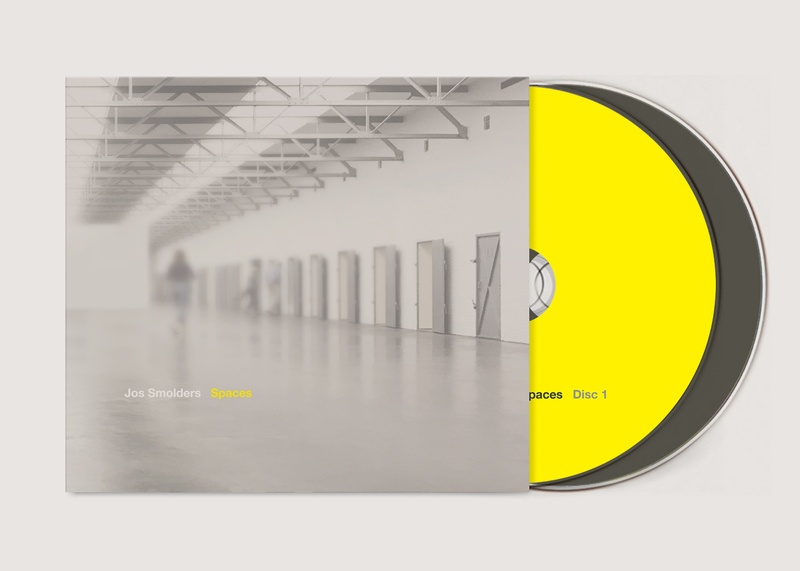 On Spaces, the second album for Moving Furniture Records, the Dutch maestro Jos Smolders presents his electro-acoustic works based on field-recordings made in various spaces in museums. The result is an inspiring collection of musique concrete works. Spaces is released as Double CD and digital and available from our shop here: https://movingfurniturerecords.bandcamp.com/album/spaces. Spaces is a series of compositions based on recordings in museums. Each work builds on a binaural recording of the environmental sounds a museum and each has been processed based on different concepts. The approach for processing and adding of electronic sounds was inspired by an artwork that was hanging in the museum space. So space and artwork form a unity. As a composer and mastering engineer I am extremely sensitive to the sounds around me. But I’m also a keen visitor of museums and while there I always listen to what the museum sounds like. Museums are spaces where people encounter works of art and are given the opportunity to contemplate on this experience. Some do this silently while others keep chatting their route and only vaguely take in what is presented. There’s a lot going on and each museum has its own sonic character. I have started collecting sounds in 2008. Snippets from these recordings have been part of many works in the years that followed. In 2015 however I decided to construct a complete sound work revolving around the sounds that I recorded. That has become A=F=L=O=A=T. This track was part of my annual musical gift to friends and colleagues and received positive feedback. Then, begin 2017, I decided to make a next move and see if other recordings could be evolved into real compositions. Gradually the concept formed, by composing, experimenting, returning to museums and study the artworks and actually the whole sonic environment of the museum. Listening to a museum makes you aware of the spatiality of a museum. The sometimes huge halls where art is presented also seem to make space in my mind. And so I thought that space would be a good metaphor for the first dimension that I want to express. The second dimension is the work of art itself, which is a silent object. It just hangs there. But it represents a whole universe of thoughts and ideas that the observer can take in and tumble around and around in his mind. My own observations I have translated into the electronic layers on top of the binaural recordings. 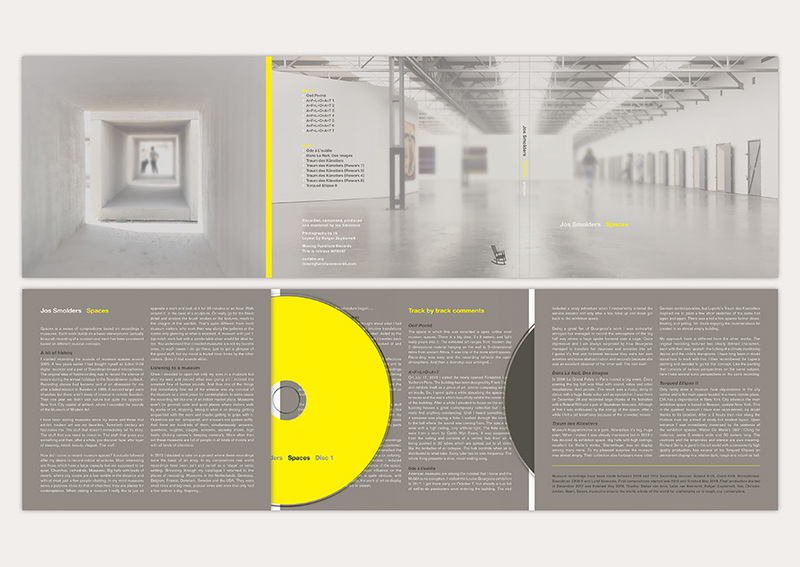 The music on the cd’s has been laid out as spacious as possible,leading to long almost silent intermissions between the tracks. In the hope of a listener with a wide open mindset. I started recording the sounds of museum spaces around 2005. A few years earlier I had bought myself an Edirol R-09 digital recorder and a pair of Soundman binaural microphones. The original idea of field-recording was to record the silence of nature during the annual holidays in the Scandinavian outback. Recording silence had become sort of an obsession for me after a failed mission in Sweden in 1999. A second target were churches but there aren’t many of those of interest in remote Sweden. Then one year we didn’t visit nature but quite the opposite: New York City, where I recorded (among a LOT of other stuff) the sounds of the Museum of Modern Art. I have been visiting museums since my teens and have always favored those that exhibit modern art. Twentieth century art has always fascinated me. The stuff that doesn’t immediately tell its story. The stuff that you need to invest in. The stuff that gives you something and then, after a while you discover layer after layer of meaning, intent, beauty, disgust. That stuff. to you. You understand that crowded museums are not my favorite ones. In such cases do go there, just to get a glimpse of the good stuff, but my mood is fouled most times by the other visitors. flew out of the window was my concept of the museum as a silent place for contemplation. In some cases the recording felt like one of an indoor market place. Museums aren’t (in general) calm and quiet places where visitors walk by works of art, stopping, taking in what is on display, getting acquainted with the work and maybe getting to grips with it. Questions are not whispered, and answers not spoken softly. And there are hundreds of them, simultaneously: answers, questions, laughter, coughs, screams, squeaky shoes, high heels, clicking camera’s, beeping camera’s. More often than not these museums are full of people in all kinds of moods and with all kinds of intentions. In 2015 I decided to take on a project where these recordings were the basis of an array. I had been using fieldrecordings ever since my first recording in 2005 as a ‘stage’ or sonic setting for compositions. But I had many more recordings that kept asking me to be included into something musical from museums in the Netherlands, Germany, Belgium, France, Denmark, Sweden and the USA. They were small ones and big ones, popular ones and ones that only had a few visitors a day. And so my museal studio adventure began….. When I finished this series I have long thought about what I had actually created. The works are all quite intuitive translations of my recollections of the museums that I visited. Aided by the recordings, the catalogues and online research I traveled back in time and along the art works that I saw, I looked at and experienced when they really spoke to me. The music that is presented on these discs is a set of reflections on the recordings. Each museum has its own character and its own particular audience. I have processed these recordings quite intuitively. The process involves many sessions of listening to the material. And then, when I feel ready I just start with whatever comes up. No sketching, no scoring. Most times I can record the additional layers in one session, sometimes two. After which an endless string of sonic refinements. The original recordings have mostly been left as they were recorded. Also stuff that is normally considered as ‘noise’ in a fieldrecording like rustling of fabric or the exchange of a few words with my companions have been left as is. Only in a few cases have collated multiple files togethers or spliced specific parts out of the frame. The additional sounds are inspired partly by the recordings themselves and partly by the works of art that I encountered. I added one or several layers to the original or intensify the atmosphere of the recording by use of dynamics or coloring. In a single case I worked in the opposite direction: I reduced what was there in order to lay bare the essence of the space. The works of art have also been a major influence on the composition. With A=F=L=O=A=T this is quite obvious, with Oeil Poche much less so. Yet, ideally, the work of art on display and the space that harbours it are in unison. It is as if the work needs to be there. The space in which this was recorded is open, unlike most museum spaces. There is a big door, 2 x 3 meters, and light really pours into it. The exhibited art ranges from modern day 2 dimensional material hanging on the wall to 3 dimensional relics from ancient Africa. It was one of the more silent spaces. Recording was easy and the recording reflects the open atmosphere. And then a doorstop was unhinged…. 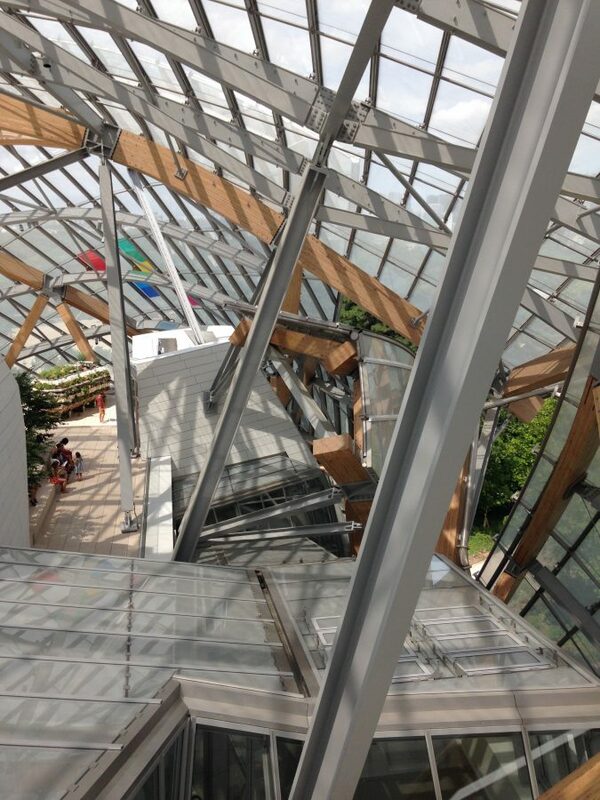 On July 17, 2016 I visited the newly opened Fondation Louis Vuitton in Paris. The building has been designed by Frank Gehry and exhibits itself as a piece of art, almost competing with the art inside. So, I spent quite a while absorbing the spaces, the terraces and the stairs which beautifully exhibit the construction of the building. After a while I decided to focus on the art. The building houses a great contemporary collection but I didn’t really find anything outstanding. Until I heard something. As if someone was playing a flute. I walked through the corridor to the hall where the sound was coming from. The space was wide with a high ceiling, only artificial light. The flute sounds were from a work by Cerith Wyn Evans. It was suspended from the ceiling and consists of a central hub from air is being pushed to 20 tubes which are spread out to all sides like the tentacles of an octopus. The hub controls when air is distributed to what tube. Every tube has its own frequency. The whole thing presents a slow, never ending song. 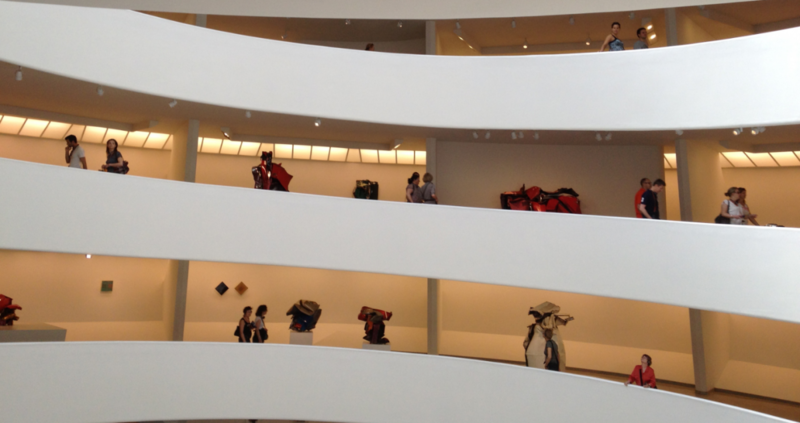 American museums are among the noisiest that I know and the MoMA is no exception. 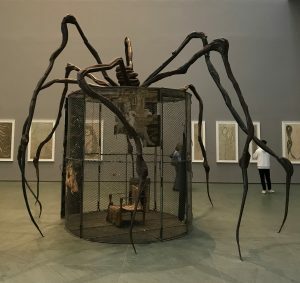 I visited the Louise Bourgeois exhibition in 2017. I got there early on October 7, but already a bus full of well-to-do pensioners were entering the building. The visit included a crazy adventure when I inadvertently entered the service elevator and only after a few rides up and down got back to the exhibition space. 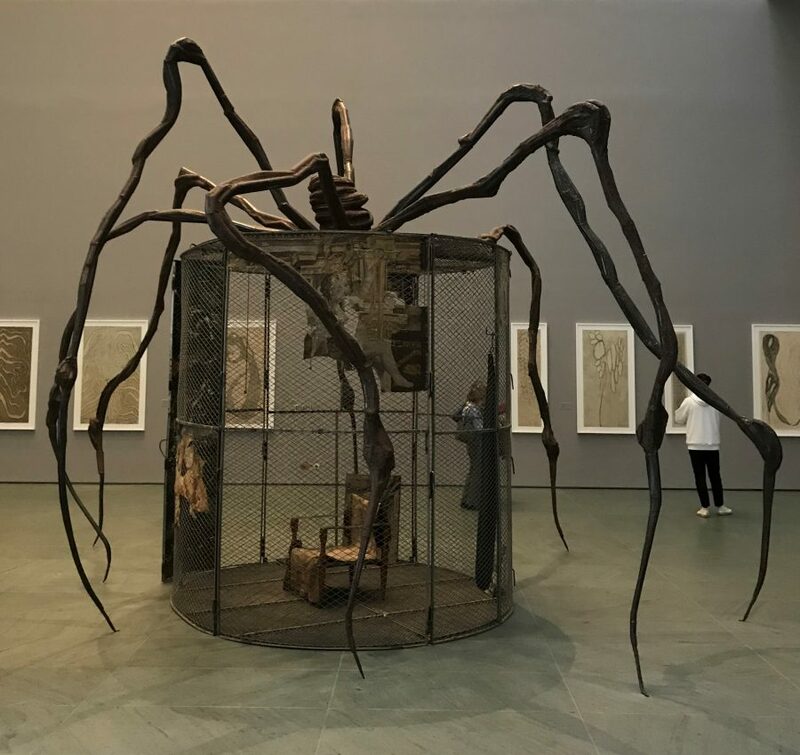 Being a great fan of Bourgeois’s work I was somewhat annoyed but managed to record the atmosphere of the big hall way where a huge spider hovered over a cage. Quite impressive and I am always surprised by how Bourgeois managed to translate her neuroses and anxieties into art. I guess it’s first and foremost because they were her own anxieties and some abstract notion and secondly because she was an excellent observer of her inner self. wall as eyecatcher. I was there on December 28 and recorded large chunks of the festivities with a Roland R09 and a pair of Soundman binaurals. Although at first I was enthoused by the energy of the space, after a while I felt a bit breathless because of the crowded noises. Museum Küppersmühle is a gem. Nowadays it’s big, huge even. When i visited it was already impressive but in 2018 it has doubled its exhibition space. Big halls with high ceilings, excellent for Kiefer’s works. Sternenlager was on display among many more. To my pleasant surprise the museum was almost empty. Their collection also harbours many other German contemporaries, but Lupertz’s Traum des Kuenstlers inspired me to paint a few short sketches of the same hall again and again. There was a kid a few spaces further down. Beating and yelling. No doubt enjoying his reverbereations in a almost empty building. My approach here is different from the other works. The original recording featured two clearly defined characters, each with their own ‘gestalt’: the ticking of a climate monitoring device and the child’s disruptions. I have long been in doubt about how to work with this. I then remembered the Lupertz painting and decided to go for that concept. Like the painting that consists of various perspectives on the same subject, here I take several sonic perspectives on the same recording. Only rarely does a museum have dependance in the city center and is the main space located in a more remote place. DIA has a dependance in New York City whereas the main exhibition space is based in Beacon, upstate New York. This is the quietest museum I have ever experienced, no doubt thanks to its location. After a 2 hours train ride along the Hudson river we arrived at nicely but modest layout. Upon entrance I was immediately immersed by the vastness of the exhibition spaces. Walter De Maria’s 360 I Ching for instance, some 6 meters wide and 50 meters long. The vastness and the emptiness and silence are awe inspiring. Richard Serra, a giant in the art world with a consistently high quality production, has several of his Torqed Ellipses on permanent display in a relative dark, rough and industrial hall.